The affordable Foliant 520T Laminator provides the perfect solution for high quality single side lamination of book covers, brochures, magazine covers, and more. The Foliant 520T Laminator is designed for low volume orders with an operating width of 20.5” and work with economical polypropylene film. This one sided laminator has a speed of 23” per minute, the sheets will not curl after lamination and is ready for cutting! The 520T machine is useful for lamination offset or digital prints and is the ideal choice for a single side lamination for small printing shops, processing sheets up to B2 size. The Foliant Series laminators work with a variety of thin gauge (1-2 mil) films. An excellent laminated finish is ensured by a chrome-coated working roller regulated by exact thermal control. 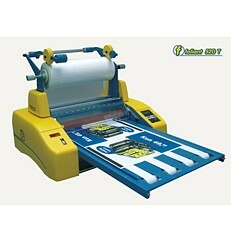 If you have any questions or are interested in purchasing the Foliant 520T Laminator, visit us at SpiralBinding.com. We have great pricing on a full line of One-Sided Laminating Machine. Call us at 1-800-631-3572 for more information!